Mind Collected is not a “mind mapping” tool in the traditional meaning of the term, but you can indeed use it to map your mind, and it provides several significant advantages. Mind maps are not necessarily a visual tool. Mind maps are text and circles and lines. Yes, mind maps map relationships visually, but they usually do not visually represent the actual objects. You might have the word “Dog” in a circle in a mind map, but you usually do not have an actual picture of a dog there – and your brain has to process the word “dog” instead of simply seeing a dog. In Mind Collected, every single object has a picture assigned to it – a photo or an illustration that you can auto-find on the Internet or provide yourself. That way, when you are browsing your collections, you immediately simply see the objects, and don’t have to process the text information first. If the relationships between objects is the most important thing, and the scope is small (less than 100 objects total), then mind maps are great. Mind maps allow you to map complex object relationships visually. In Mind Collected, objects are connected using item connections and hyperlinks in their notes, similar to an encyclopedia or the Internet. But you don’t see arrows etc. In Mind Collected, connecting each object to a dozen of other objects is not a problem, and might even help you build new mental associations and lead you to new insights. Contrary, when using mind maps, you might sometimes hesitate to connect an object to multiple other objects, as this will quickly visually clutter the map. Mind Collected allows you to manage thousands of objects easily, a feat that’s close to impossible with mind maps. The maximum practical size of mind map is limited. Also, you can’t really intimately connect multiple mind-maps into one grand mind-map – it would be very time consuming, and the resulting “grand map” would be cumbersome to navigate. If you decide to create a large mind map, you might get frustrated – navigating complex mind maps on the computer (or otherwise) can get frustrating quickly. Mind Collected offers several ways of navigation (tags, connected items, hyperlinks, quick tag/object filter). This, combined with the fact it is visual (thus you immediately know you’ve found what you are looking for, as you simply see it), makes navigating in it much easier and fun. Mind maps are bad for capturing details and lots of notes for each object. In Mind Collected, every object has rich notes that support hyperlinks to other objects and external resources. You can even add sub-objects (additional pictures, links, files and objects). A limiting factor of mind maps is that every item in the mind map has just one fixed location, but what if it actually belongs into many places? In Mind Collected, you can assign multiple tags to every object (so a particular book can have tags “book, biology, have read, kindle, project A”). Additionally, you can then connect that object to even dozens of other objects if you want to. Most importantly, you can assign it a big picture (e.g. the book cover). Optionally, you can give it some overlay icons as well (e.g. “4 stars” icon). Using tags for organizing and navigating your collection is very efficient, because it resembles how your mind actually works. Tags allow you to create multiple “dynamic” collections based on the context of the tag. Every object can be in any number of such collections, because it can have any number of tags. Mind maps are better when seeing the relationships between the objects is the most important factor. be able to use tags (e.g. so each object can exist in multiple collections represented by tags). You can also get the best of the both worlds: When needed, you can simply add a shortcut or hyperlink to a mind map file into any of your objects in Mind Collected. Question : What is the difference between Mind Collected and Evernote? Mind Collected is visual. Every item in Mind Collected has a picture associated with it, and Mind Collected even allows you to auto-find the pictures on the Internet automatically. Another one of the interesting features is the ability to view any of the images in full size easily, e.g. by just clicking an item with the middle mouse button (and holding it). You can add even multiple images into a single item, in the form of sub-items. Mind Collected also supports “overlay icons”, which allow you to add extra visual indicators to your individual notes. 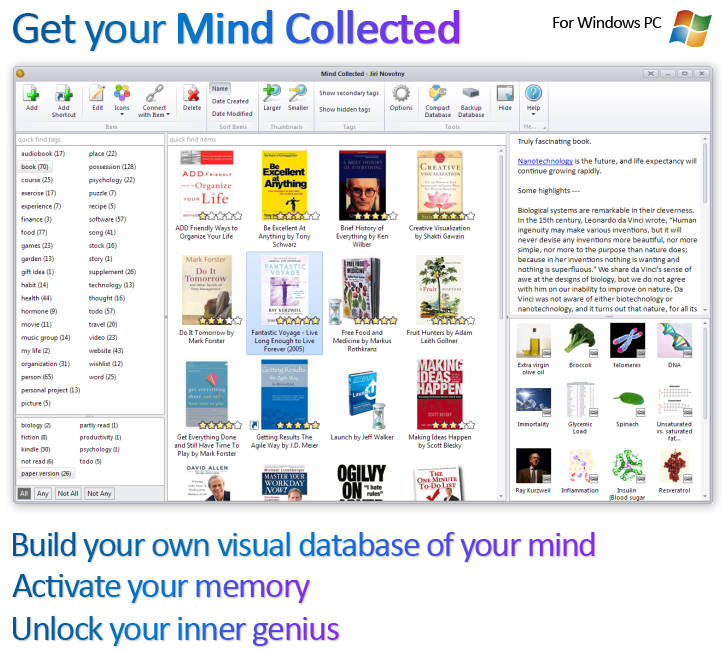 Also, Mind Collected is a desktop application, and doesn’t put your data into cloud – thus it is completely private and secure. Since it has been designed primarily for desktop use, it also has better notes editor, because it supports more keyboard shortcuts and supports import/export into more formats (including MS Word, PDF, etc).